The RE@CT project will introduce a new production methology to create film quality interactive characters from 3D video capture of actor performance. Recent advances in graphics hardware have produced interactive video games with photo-realistic scenes. However, interactive characters still lack the visual appeal and subtle details of real actor performance as captured on film. In addition, existing production pipelines for authoring animated characters are highly labour intensive. RE@CT aims to revolutionise the production of realistic characters and significantly reduce costs by developing an automated process to extract and represent animated characters from actor performance capture in a multiple camera studio. The key innovation is the development of methods for analysis and representation of 3D video to allow reuse for realtime interactive animation. 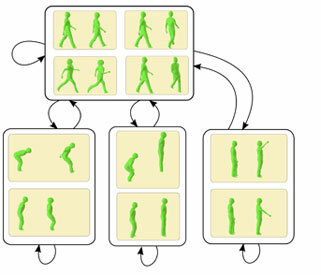 This will enable efficient authoring of interactive characters with video quality appearance and motion. The project builds on the latest advances in 3D and free-viewpoint video from the contributing project partners. For interactive applications, the technical challenges are to achieve another step change in visual quality and to transform captured 3D video data into a representation that can be used to synthesise new actions and is compatible with current gaming technology.